Hey class mom! 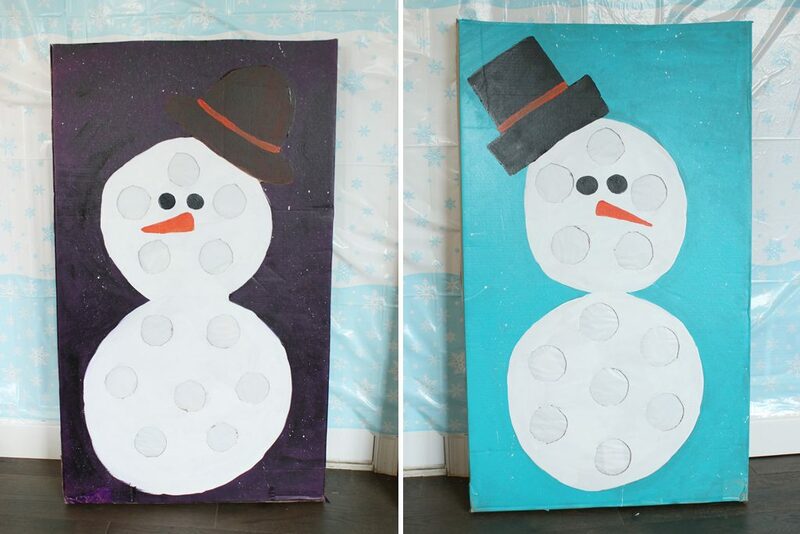 Are you in charge of the winter class party and need a fun activity the kids will love? Try a prize punch box! This physical activity doesn’t take much strength or special skill so it’s bound to easily be a hit in your child’s class this season as an activity everyone can enjoy. 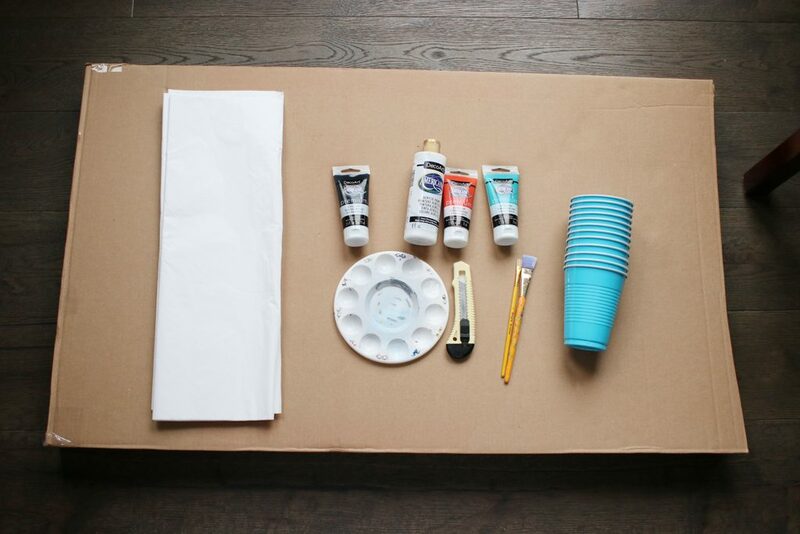 Learn how to turn a cardboard box into this fun activity which you can paint and design to fit any party theme. Fill it with all types of goodies, activity sheets, small favors, art supplies or treats allowed by your school. This fun alternative to a piñata allows everyone to be a winner! With activity planning taken care of, pick up any extra supplies you’ll need to plan the perfect winter party from our shop. 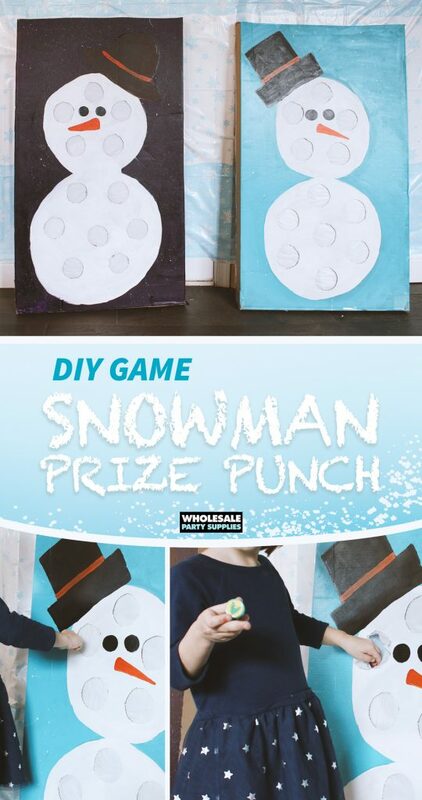 This punch box game is guaranteed fun for any winter party! Take it from Tara at Spot of Tea Designs. 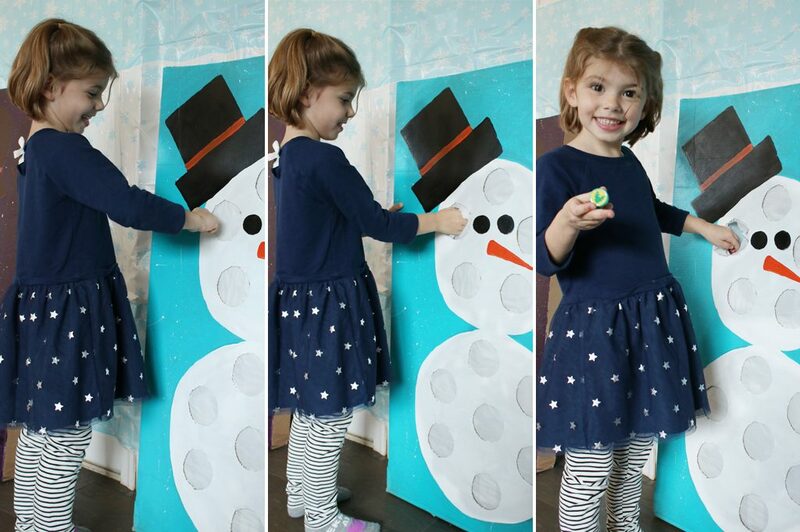 She wrote, styled and shot this crafty game tutorial and her daughter gave the seal of approval! Stop by her blog for more kid-tested family fun. 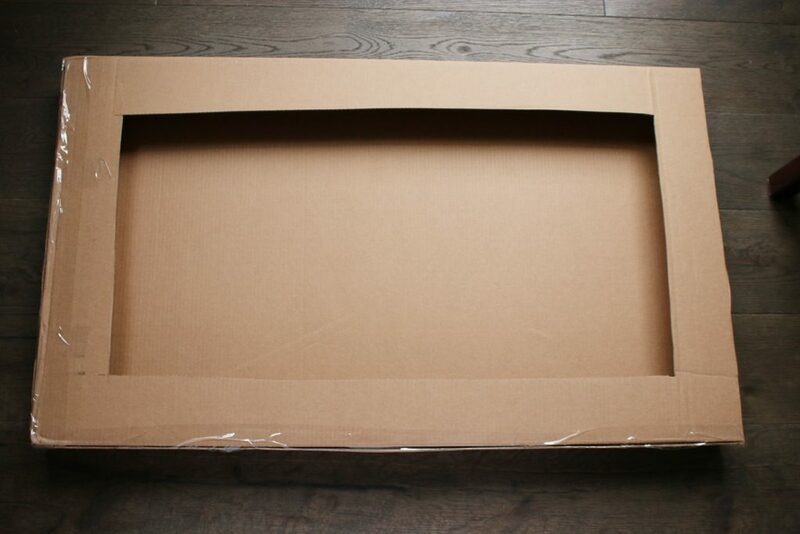 First, turn your box over and cut out the back of the box. This will allow you to have better access to the back as you put the cups on for the prize holders. 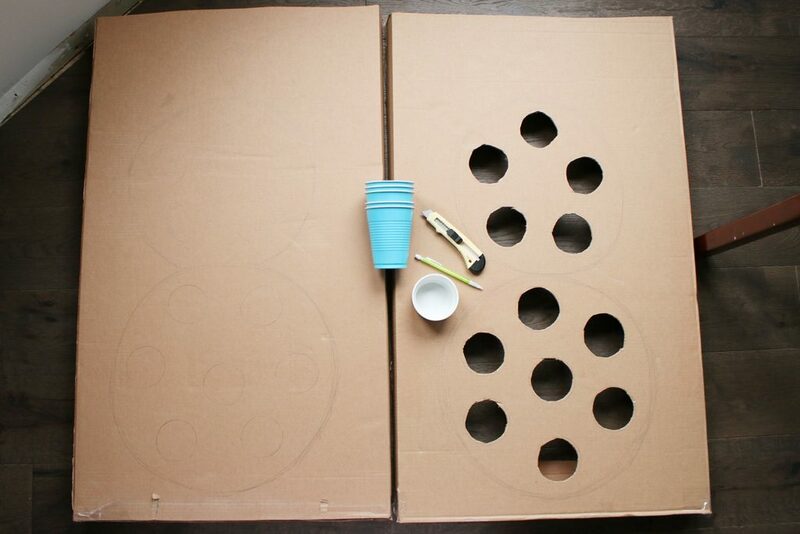 Next, draw your design on the front of the box and determine where your holes for prizes will fit into the design. 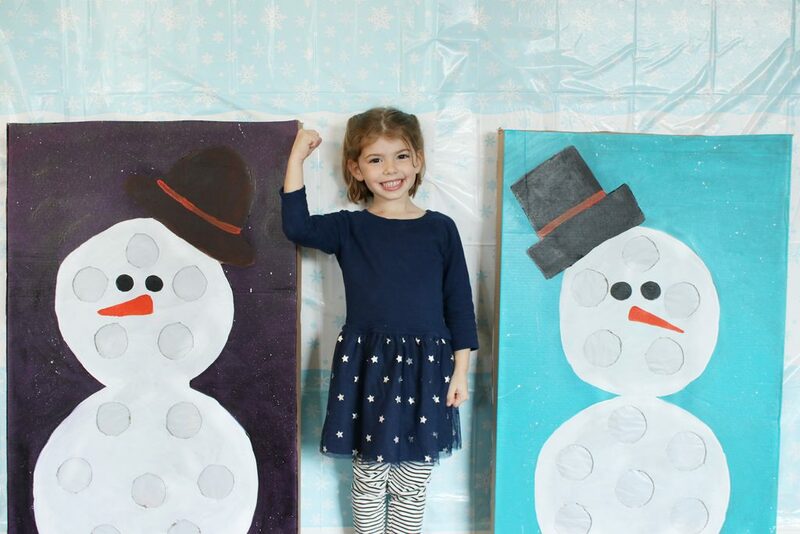 For this winter party, we needed 2 snowmen so there were enough prizes to be won by each student in the class. The holes will be located on the snowman body and head. Each prize will be housed in plastic cups on the back of the punch box. Find an object smaller than your cup mouth opening to trace for prize holes. 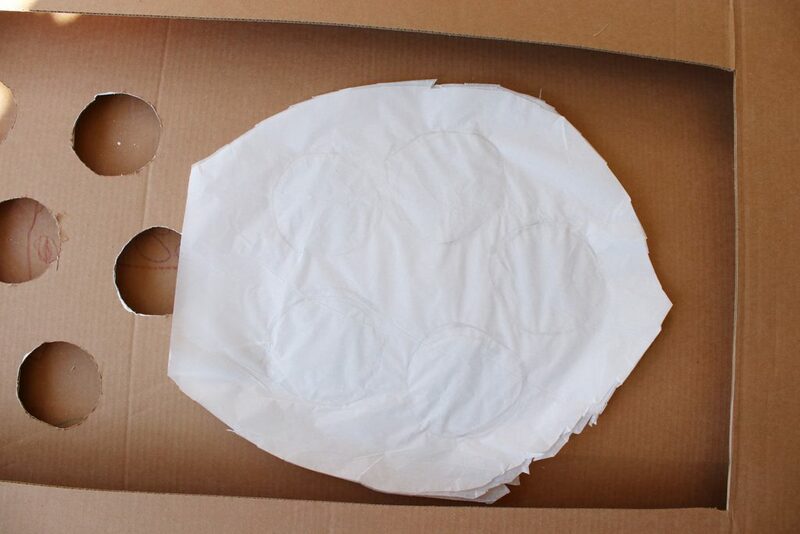 Cut out these circle shapes with a box cutter. 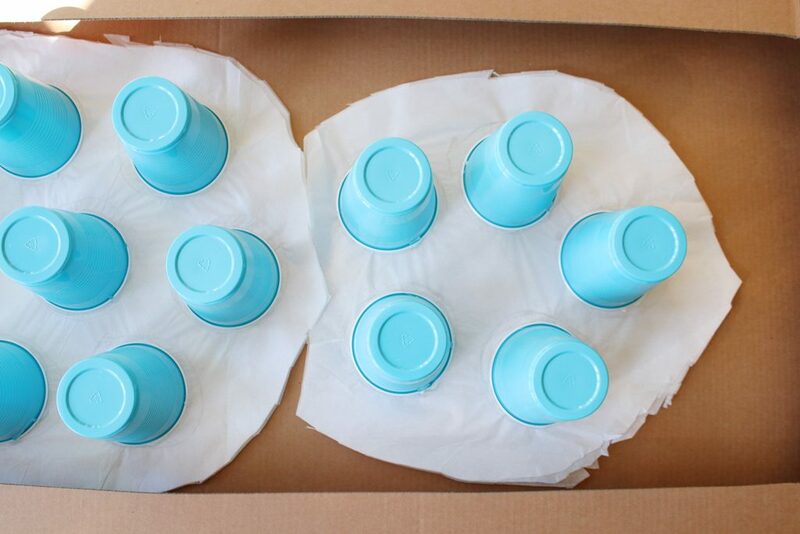 Paint the front of the box with your design of choice. Once dry, turn the box over. 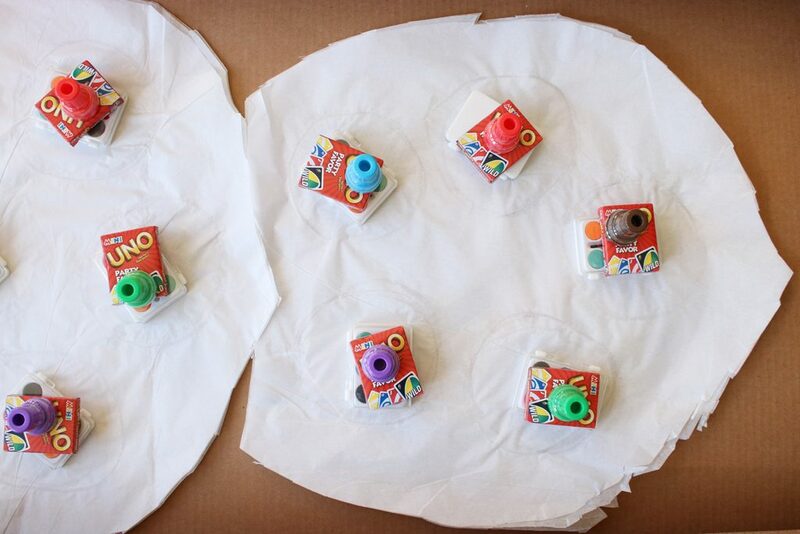 Run hot glue around the perimeter of each hole and attach tissue paper over the holes. Tip: add 2 or 3 layers of tissue paper on top if you think it’s too thin. 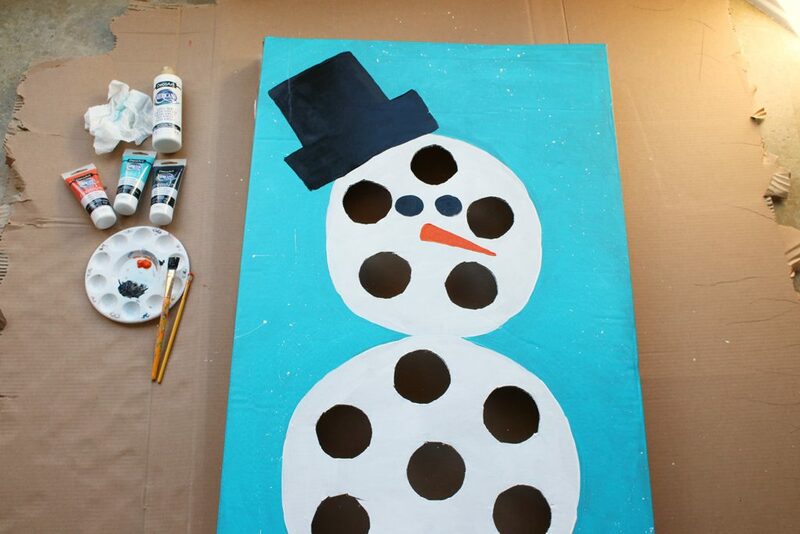 This design allowed for one large sheet over the holes since it’s white snowman body, but you could also mix and match the tissue paper colors over the holes. 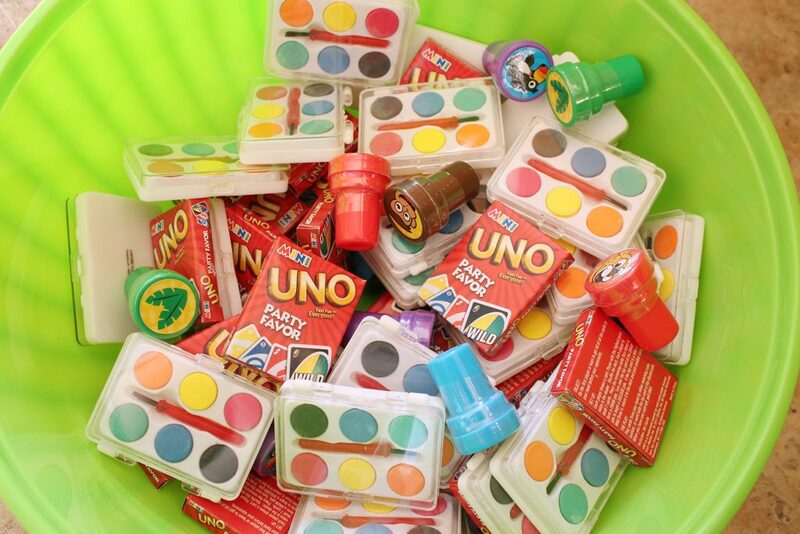 We filled this prize box with mini watercoloring color sets, Mini Uno card games and colorful animal stampers. Tip: avoid food or treat items in case there are any food allergies in the class. Place prizes on the tissue paper coverings, making sure they aren’t too heavy to break through. 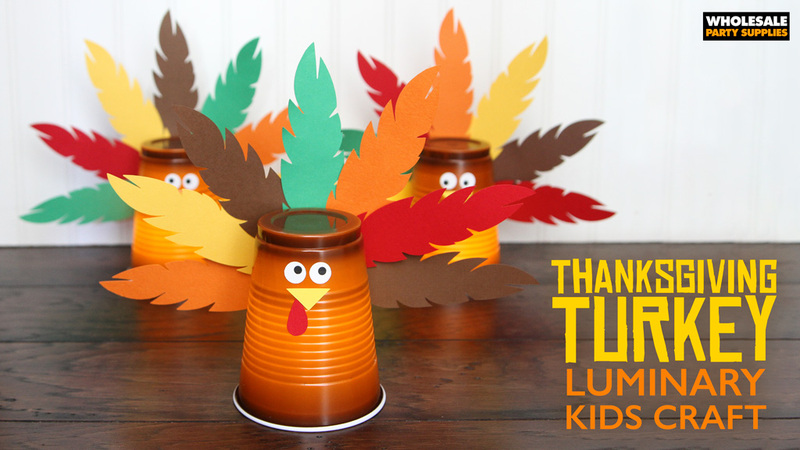 Use hot glue to adhere the cups over the prizes and tissue paper holes. Kids will all smile and be excited by these frosty friends! On the party day, have kids take turns to punch through a hole and grab a prize from inside! They will all feel like Superman as they should be able to easily punch through the tissue paper holes. When you ask your kids what happened at school that day they will be excited to share the news with you upon returning home from school that day! 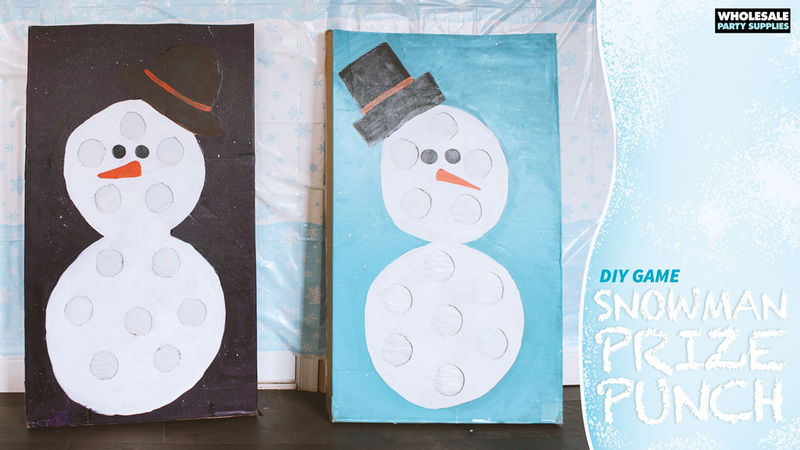 Not only is this activity fun for a large group, but a punch box gives the countdown to Christmas a DIY twist. So ditch the typical advent calendar, and create this punch box game with your kids now so you can fill it before December 1st. Only you will know what prizes hide inside. Think about the spirit of the season and fill each cup with love notes, family photos, or messages to encourage a small act of kindness. Good things really can come in small packages!